This entry was posted on Friday, June 19th, 2009 at 12:52 am	and is filed under bus, commuter rail, delays, metrocard, service alert. You can follow any responses to this entry through the RSS 2.0 feed. You can leave a response, or trackback from your own site. I can’t even see what they were trying to say. Epic FAIL. I mean like totally. I went through that area several times and I can assure you that the were no where to be seen. To their credit, the error *was* corrected within about an hour after I made the screen shot. 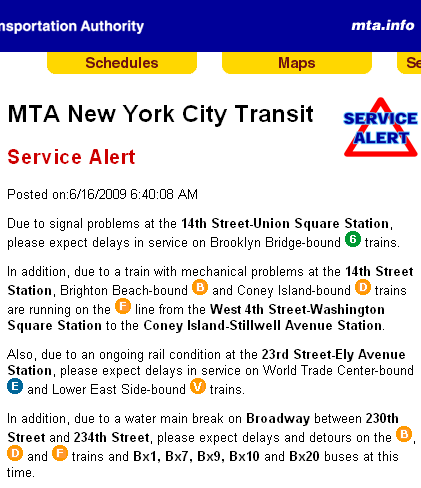 Too bad no one got a screen shot of 1 train service “suspended” between 215 and 242 on 7/11/09 due to marine traffic . . .when there was ZERO 1 service anyway due to that 137 to 242 shuttle bus G.O.. But this alert is a better gem more than anything else. . .your fare dollars hard at work. Amazing they didn’t mention 76th Street-bound C service.